Action Solidarité Tiers Monde (ASTM) is shocked by the terrible news of the murder of Benjamin Ramos, founder and director of the “Paguida-et sa Kauswagan” Development Group (PDG) in the Philippines. The Luxembourg development NGO joins other partner associations and PDG in strongly condemning this murder, which is a yet another instance of the growing criminalisation of civil society organisations in the Philippines. Ben Ramos was shot and killed on Tuesday November 6th outside a store in Kabankalan, Negros Island, by two men wearing motorcycle hoods. Although he had known himself to be under threat for a long time he never relented in his fight for the rights of the small farmers on the island of Negros. Ben Ramos, a lawyer by training, was the founder and director of the PDG organization, which was established in 1987 and has been an ASTM partner since 2013. Its objective is to contribute to the development of rural communities in the province of Negros Occidental. As a dedicated people’s lawyer, Ben Ramos extended his pro bono services to the rural poor in their struggle to assert their human rights and their rights to land and food throughout the island of Negros. These are small farmers, landless agricultural workers and marginal fisherfolk. Most recently, he was giving legal assistance to the National Federation of Sugar Cane Workers after the murder of 9 of its members by armed men in the town of Sagay in October. Ben Ramos last visited Luxembourg in November 2016, after attending the Monsanto Tribunal in The Hague. “Ben was an extremely committed, passionate person who put his legal skills at the service of the struggle for small farmers’ land rights and sustainable agriculture while being aware of the enormous risks to his life. Several ASTM members had met him in the recent years during ASTM’s missions to the Philippines or his visits here. We are really in a state of shock,” says Julie Smit, an ASTM volunteer. Ben Ramos had been threatened several times in the past. In 2006 and 2007 he was subjected to surveillance by military intelligence services and escaped an assassination attempt in 2007. In April 2018 his picture had appeared on a public poster alleging that he and others were members of an illegal armed movement. He was very much aware that his life and the life of those working with him were in danger. 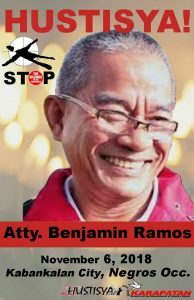 The assassination of Ben Ramos is of great concern to ASTM because it is yet another example of the increasing criminalization of ASTM’s partners in the Philippines, who are in the forefront of attacks by President Rodrigo Duterte’s administration because of their work in defence of human rights. They face daily problems related to the increasing militarization, illegal arrests, extrajudicial killings and false accusations of belonging to terrorist groups. In December 2017, Father Marcelito Paez, a 72-year-old former priest and treasurer of our partner organization, NE-CBHP in the province of Nueva Ecija, was brutally murdered. Furthermore, our partner KMP (Peasant Movement of the Philippines) has reported that 158 farmers’ leaders were murdered between July 2016 and September 2018. Since Duterte came to power in 2016, some 23,000 people, most of them belonging to the poorest sectors of society, have been murdered as a result of his anti-drug campaign and 143,000 people have been imprisoned. Ben Ramos is the 34th lawyer killed under the Duterte administration. Most alarming is the fact that, apart from the many thousands of presumed drug users and pedlars, the majority of those killed were political prisoners, human rights defenders, alleged rebels or development workers. ASTM will continue to denounce the alarming situation of human rights defenders in the Philippines and call for justice for victims of human rights violations.